Visit our new location, in the Montrose Mall! We specialize in affordable professionally refurbished Computer systems and upgrades and virus elimination! We sell a wide array of new and used equipment, cables, accessories and add-ons. We also carry a wide assortment of off-lease laptops and towers for all your computing needs. Item Inventories vary daily, so give a call. We carry most major brand names for computer parts, laptop computers, desktop systems, & PC accessories. Our parts selection has everything you need or want including refurbished and on-sale items. We offer affordable professional refurbished Computer systems, custom builds, and Xbox and PS3 gaming systems. If you wish to sell your old equipment, we do offer trade ins and upgrades. We have purchased and amalgamated with Island Inkjet to provide even more services! We can now save you money on your printing by refilling your ink cartridges saving you 40%-60%! People have the right to quality computer service at a reasonable price. 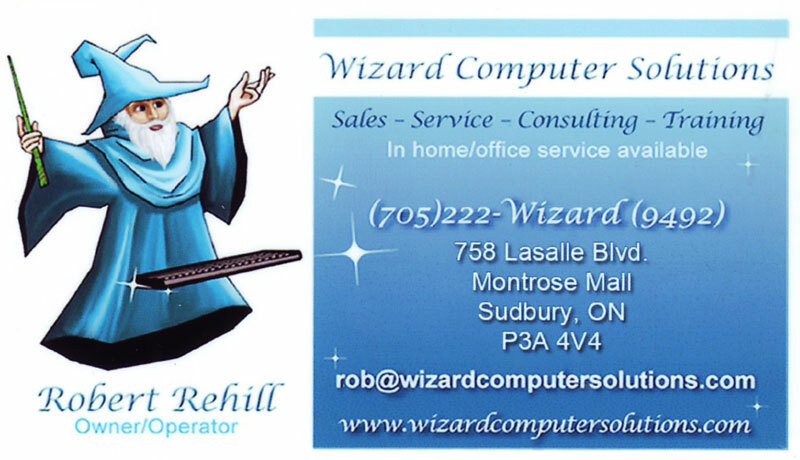 Wizard Computer Solutions, Computer Stores, Computer Consultants, Computer Repair & Cleaning, Inks, in Sudbury, Ontario.